Highly acclaimed country pop band Lady Antebellum have announced a major UK arena tour for October 2017. The GRAMMY Award winning Nashville based band encompasses Hilary Scott (lead vocals), Charles Kelley (lead, background vocals and guitar) and Dave Haywood (background vocals, guitar, piano and mandolin). They have sold 10 million albums in the United States alone. Click HERE for your Lady Antebellum tickets. Get ready for the huge annual celebration of everything Folk. Shrewsbury Folk Festival gathers together the world leaders to showcase the talents of the traditional greats and impressive innovators. The festival runs from Friday 25th until Monday 28th of August and takes place at the West Midlands Showground. Click HERE for your Shrewsbury Folk Festival 2017 tickets. Get ready for three days of full on dance action when Lockdown Festival takes over Powderham Castle from Friday 1st until Sunday 3rd of September. The massive South West weekender boasts some of the biggest names including Wiley, Sigma, Dizzee Rascal plus Chase And Status. Good times absolutely guaranteed. Click HERE for your Lockdown Festival tickets. 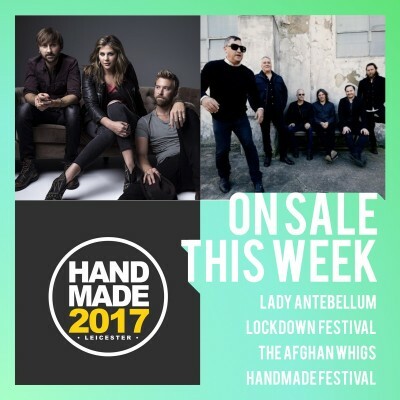 Taking place at O2 Academy Leicester over Saturday 29th and Sunday 30th of April, Handmade is one of the first festivals of the year and is often a good indicator of the musical character of the year to come. This year they treat you to the likes of Twin Atlantic, Frightened Rabbit, Pulled Apart By Horses, British Sea Power and many more! Click HERE for your Handmade 2017 tickets. Held at Victoria Park on Sunday 16th of July, London festival Citadel promised to be a mighty day of fun. Foals will be making their only UK festival appearance and many more top acts will be announced very soon. Click HERE for your Citadel tickets. Rock And Bike Festival fuses biking culture with the best hard and heavy music around. You can look forward to impressive shows of custom bikes and witness the immense talent taking part in the Tattoo Competitions. Click HERE for your Rock And Bike Festival 2017 tickets. Premier post punks The Jesus and Mary Chain are back with their new album Damage And Joy. The celebrated cult band have remained ever popular ever since the release of their debut album Psychocandy and begin their tour towards the end of March. When he isn’t busy saving the day playing Jack Bauer in 24, it turns out Kiefer Sutherland is actually a formidable blues guitarist. He has recently announced a string of unmissable summer shows on sale right now!